Want to live longer? That’s a no brainer! 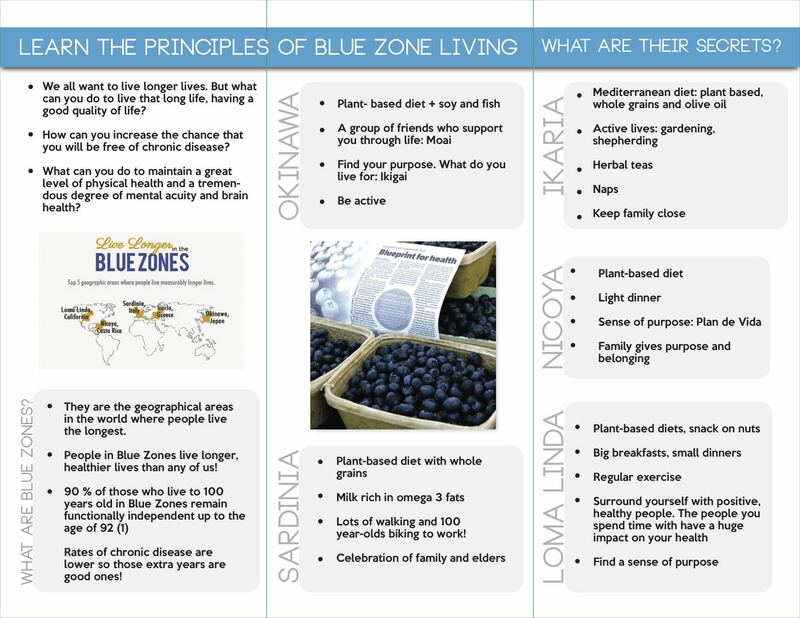 Well, studies show that people living in Blue Zones are achieving this. What’s a Blue Zone you ask? Check out the pamphlets to find out and learn how to apply their healthy guidelines into your lifestyle! What is the best way to fuel your body for sporting activities? What makes a good pre-snack? What makes a good post-snack, helping to rebuild muscle mass and helping your body to recover? Find out some great tips, suggestions and information for yourself and your children on this tour. Do you want to learn a simple trick for healthy eating? One that doesn't involve counting calories, measuring servings or weighing your food? Do you wish you had a simple tool to help make your life healthier? If this sounds like you, then the ‘half your plate method’ is right for you!